Washington, D.C. – The United States Supreme Court held that in those cases in which summary disposition by the court is inappropriate, and where a jury has been empaneled, trademark tacking for purpose of determining priority is a question of fact for the jury to decide. Hana Financial, Inc. and Hana Bank both provide financial services to individuals in the United States. Hana Bank was established in 1971 under the name Korea Investment Financial Corporation. It adopted the name “Hana Bank” for use in Korea in 1991. It began advertising in the United States as “Hana Overseas Korean Club” in 1994. This name was changed to “Hana World Center” in 2000. In 2002, it began banking under the name “Hana Bank” in the United States. Hana Financial began using its name in 1995 in the United States. In 2007, it sued Hana Bank for trademark infringement. Hana Bank defended against this claim by invoking the tacking doctrine, under which a trademark user may make limited modifications to its trademark while retaining the priority provided by the initial trademark. The jury held for Hana Bank. On appeal, the Court of Appeals for the Ninth Circuit affirmed, concluding that tacking was a “highly fact-sensitive inquiry” that was properly the province of the jury. 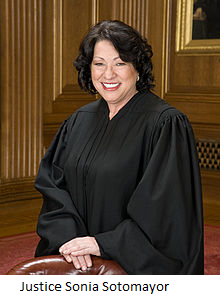 Justice Sotomayor delivered the unanimous opinion of the Court for Case no. 13-1211.